DUMBARTON battled bravery to earn a 0-0 draw with premier league top six side Dundee in a continual downpour at the Cheaper Insurance Direct Stadium. DUMBARTON battled bravely to earn a 0-0 draw with premier league top six side Dundee in a continual downpour in front of a 1,410 crowd at the Cheaper Insurance Direct Stadium in round five of the William Hill Scottish Cup. Visiting fans clearly outnumbered the home support, and they had more to cheer about as Paul Hartley's men fashioned a number of good chances. At the home the Sons fans saw a fine debut performance by striker Christian Nade against one of his several former clubs, and with a little bit of luck he could have scored on a couple of occasions. After the break Stevie Aitken's side had the wind behind them, but Dundee continued to dominate, forcing some excellent saves from keeper Jamie Ewings. Sons looked dangerous on the break, but did little to trouble visiting keeper Scott Bain. Now the two sides must do it all again at Dens Park, with the prize for the winner a place in the quarter-finals. 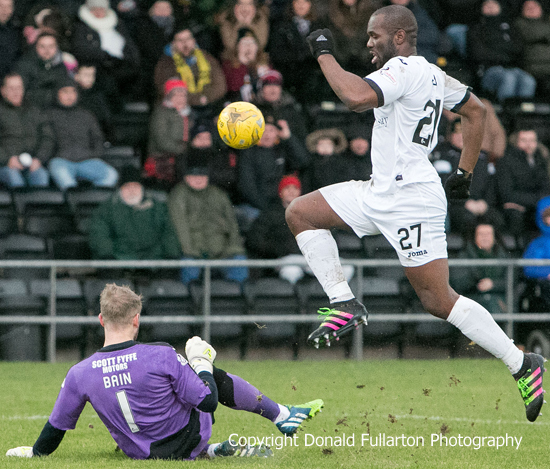 The picture shows Christian Nade hurdling keeper Bain.